What keeps a fun monster movie from being a bad movie? How about a handful of well executed classic elements? The savvy police inspector (played with panache by Hugo Weaving) making himself at home in a pub while the locals all stare in provincial fear. Or creepy underground shrines awash in candlelight while Anthony Hopkins delivers half-baked lines as if they were Shakespeare. Or a werewolf designed in a classic mold, but far more real and far scarier. Joe Johnston’s modest but entertaining The Wolf Man has all of these elements, along with some terrific action scenes and a certain measure of “Ohhh!” inspiring gore. Yet all is not roses. Benicio del Toro occasionally seems to be reading from que cards, and there are jumps in plot development that you just have to take for granted. Fortunately, Hopkins as the father and Weaving steal the show and raise the level of the picture. They realize that they are performing in a werewolf movie, and so they add a little ham to the cheese, and they do it well. In fact, Weaving as the Wolf Man would have been a much better movie. Del Toro’s squint-for-emotion act doesn’t work here, and neither does his “American” accent. He’s just trying too hard on both accounts. 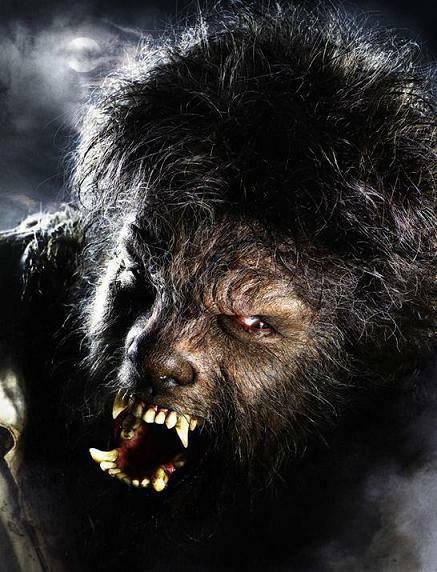 But the makeup and effects crew who did the werewolf and the action scenes did a phenomenal job. Rarely do you see fully fleshed out wolf attack scenes that are as expertly choreographed and exciting. I have other qualms, none of them a deal-breaker. I could have done without the werewolf vs. werewolf showdown near the end. I’m sure it seemed like an excellent opportunity for some serious fighting acrobatics, but really, werewolves are a lot scarier and more interesting when contrasted with regular human beings, who cannot fight back with superhuman strength and claws. And werewolves should never attempt to speak, even in romantic moments. It’s squeamishly silly. Emily Blunt is appropriately pretty in a 19th century kind of way, and the cinematography is clean and lit like a good graphic novel. Watch it for a (simple) good time. This entry was posted on August 4, 2010 by Ian Kay. It was filed under The Wolfman (2010) and was tagged with wolfman.